When you’re designing a solar array, shading is the enemy. Most locations for solar projects tend to get around 5 to 6 net sun-hours per day, so anything that obstructs that sunlight needs to be avoided at all costs. Shading just one corner of a module can cut production in half, so avoiding shade on the array is important. This is mainly an issue on ground mounts and some flat roof mounts, where rows of solar panels need to be optimally spaced to best use the available space. With limited solar resource and steep penalties for failure, properly determining correct shade spacing is a critical calculation in solar system design. The procedure for calculating shadow spacing starts with the sun’s position in the sky on the winter solstice, December 21st. 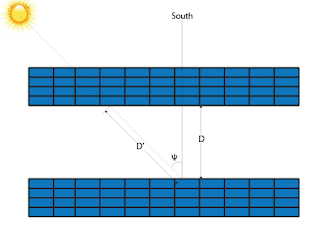 You need to obtain the minimum solar altitude angle α, which is the minimum angle the sun makes with the ground in your shade-free solar window (figure 1). For a 4 ho­­ur solar window, you want to obtain the sun’s altitude angle at 10 AM or 2 PM on December 21st, because that is when the sun will be lowest in the sky. For a 5 hour window, you will need the sun’s altitude at 9:30 AM or 2:30 PM instead. When you find this angle, you will most likely also be able to get the suns azimuth angle, ψ. This is how far off true south the sun’s position is (figure 2), and will be needed to obtain the minimum allowable row spacing. Finding values for local Solar Azimuth and Altitude angles on the winter solstice can be a challenge. Luckily for the modern solar designer, there are tools available that greatly simplify the process. 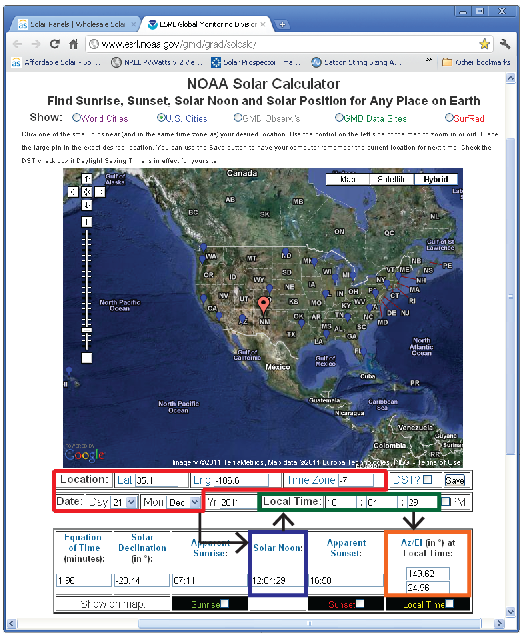 The tool I have selected is the NOAA Solar Calculator, available for free online at http://www.esrl.noaa.gov/gmd/grad/solcalc/. By clicking a location on the map, you are given coordinate and time zone information, and by entering the date for the winter solstice, December 21, the “worst case” position of the sun is easily obtainable. The procedure for using NOAA’s Solar Calculator has been visually outlined on the webpage below. Step 1: Red – Enter your initial project inputs. This is your location in coordinates, the time zone, and December 21st. Select a city in your time zone that has a marker on the map to find your time zone value. As easy way to find coordinates is to go to itouchmap.com/latlong.html and put the pointer on your location. Step 2: Blue – Find Solar Noon based on your location, time zone, and the date. If you are located in the western half of your time zone, this value is typically later than local time. For the eastern half of a time zone, it will be earlier than local time. Step 3: Green – Enter in the earliest time in the day on December 21st that the solar array should be without shading. If you are designing for a shade-free solar window in the middle of the day, take the overall length of the solar window in hours and divide by two. Subtract this value in hours from Solar Noon and enter it for Local Time. Step 4: Orange - Obtain your worst-case Solar Azimuth and Altitude angles at Local Time, which will be used in the shading calculations to determine the minimum spacing. The top value is the Solar Azimuth angle, while the bottom is the Solar Altitude angle. Using the morning sun position, the Solar Azimuth angle should always be less than 180 degrees, and the Solar Altitude angle should be between 15 and 35 degrees for most locations in the United States. Using NOAA’s solar position calculator, the only information you need to quickly and painlessly determine shadow spacing is the height of the row or obstruction, your desired shade-free solar window, and the location in decimal-degree coordinate form. With this method, you can accurately determine your solar panel spacing from obstructions with only a few simple steps. I never realized all of the mathematical equations that go into making sure you have the best angles to save energy with your solar shades. So is this what the specialists have to look at and calculate when finding the best places for solar shades? It's helpful that you also include the different colors that correspond with the diagram above with what the benefits of each time of day will have on the locations of the sun rays.